Segovia is a tremendously picturesque town in Spain’s central Castille region and is a delight for the gourmet traveler. It has one of the largest concentrations of Romanesque churches in all of Europe, most dating back to the 11th century. It is home to the famous Alcazar castle, which was the inspiration for Walt Disney’s Sleeping Beauty Castle and the place where Queen Isabel gave Columbus financial backing for his trip to discover the Americas. Segovia is bordered by two rivers and is a beautiful city full of narrow cobblestone streets. The inhabitants of the town have a penchant for suckling pig and full-bodied Ribera Del Duero wines, which are a treat when enjoyed in the atmospheric, traditional “Asador” restaurants in the old town. There are charming, classically Spanish streets, restaurants, and cafes. Segovia has a rich architectural heritage, full of Gothic, Roman and Romanesque styles. In Roman and Medieval times Segovia had great importance regarding wool production and was the strategic site of a Roman military base. Today, it is known for agriculture and tourism. In 1985, Segovia’s tourism popularity grew when it was declared by UNESCO, “Heritage of Mankind.” The city is very close to Madrid, a 54-mile drive that makes it an easy and attractive destination for tourists. Hidden within the mountains this small charming town is a must-see for visitors to Spain. Although this city is known for its religious and cultural heritage, there is another side to Segovia that some don’t see. 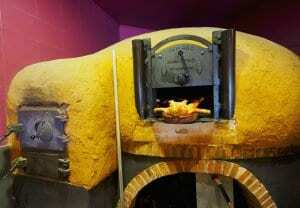 As in other parts of Spain, Segovia is famous for its love of the pig, cooked in a million ways. Roast suckling pig, cochinillo, is a delicacy in Segovia. Fish, cured pork, and cold sausages are a few more of the common ingredients that you will find in Segovian dishes. There is a wonderful variety of cheeses using sheep, goat, and the traditional cow’s milk. A major part of Segovian gastronomy is the use of mushrooms in dishes. Segovia is known for Black Truffles and has one of the most highly regarded regions in Spain for its gastronomy. There are the usual array of oddities, such as frog legs, escargot, dried beef and horse-meat that will appear on the menus and are worth a try if you dare. There is a deep-rooted wine tradition in Castilla y Leon, which dates back literally centuries. There are a variety of grapes that are cultivated along the Duero river, but the only ones allowed in the prestigious Ribera del Duero appellation are Tempranillo (called Tinta del Pais locally, red), and Albillo (a neutral white grape long out of fashion). In the other wine regions such as Rueda and Toro, Tinta del Pais is grown along with Verdejo, Mencia, and Prieto Picudo grape varieties. The climate is very dry and windy with cold winters creating a sound environment for Tempranillo and other local grape varieties. Aromatic, very fruity red wines are the main success of this area. In the western part of the city lies a magnificent castle that rises above the city. It houses both an armor museum, including a tour through the old decorated rooms of the castle, as well as a spectacular view from the top tower that can’t be missed. The present building was constructed in 1862 after a fire. This cathedral dates back to 1525 and is the last gothic church built in Spain. It was built to replace the one destroyed during a revolt. The cloister was the old surviving piece of the old cathedral and the foundation for the building of the present cathedral. The cathedral is surrounded by flying buttresses and silhouettes and contains a magnificent vaulted interior. This aqueduct is over 2,000 years old and was originally built by Roman settlers, who historically used Segovia as a military base. It is the largest and most well preserved of any in Europe. It is composed of 20,400 stone blocks and does not contain any type of top covering or an ounce of mortar. 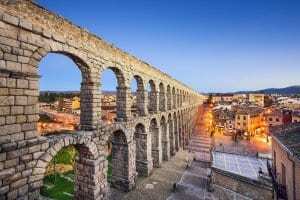 The aqueduct is one of the most impressive in Europe. Casa de Los Picos is an ancient Jewish home that has been converted into a museum. Legend has it that the new owners put the pyramid-like peaks as tiles sticking out of the edifice to ward off the bad spirits and the idea that the Jews may have left in the building.